You'll begin your tour with the origin of chocolate in the United States, and taste chocolate with a recipe from the 1740's. Next you'll sample organic chocolate, ground locally with traditional Mexican stone mills. We'll also try a spicy chili & chocolate drink, served hot or iced depending on the season. Then we'll have a secret chocolate stop for some unique chocolate combinations. What could be better than freshly baked chocolate chip cookies? The white chocolate infused milk. 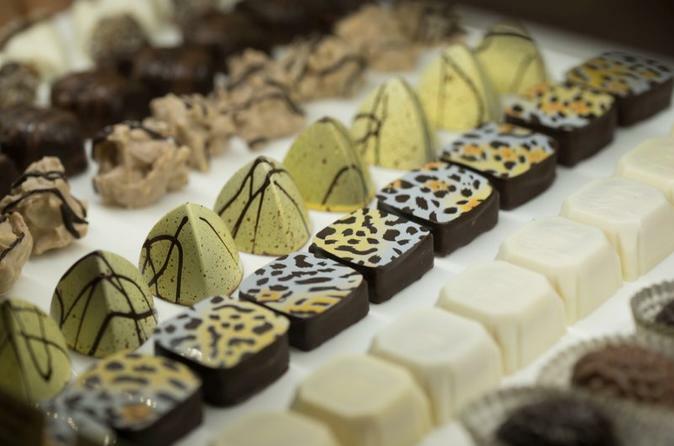 A Best of Boston chocolatier is our next stop for locally made truffles. And to finish the tour, we'll sample a small taste of chocolate gelato. Meeting point: We will meet in front of the Old North Church, at 193 Salem St, Boston, MA 02113. This meeting spot is located on the Freedom Trail and is an 8 minute walk from the Haymarket T stop. The tour will end on Charles Street in Beacon Hill, which is a 4 minute walk from the Charles MGH T stop. (The T is Bostonian slang for the MBTA, America's oldest subway. The Haymarket stop is accessible by the orange and green lines, while the Charles MGH stop is accessible by the red line.) Your guide will be holding a bright orange umbrella.